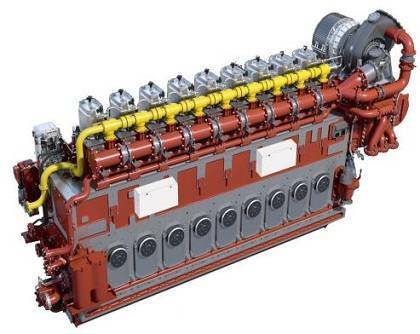 Caterpillar Marine Power Systems announce the development of the MaK M 34 DF, a new marine dual fuel engine platform for the commercial marine industry. The M 34 DF dual fuel engine boasts a power rating of 500 kW per cylinder at 720 and 750 rpm in diesel and gas modes, and will share the same footprint as the highly successful M 32 C engine series. The M 34 DF will be capable of running on natural gas as an alternative to marine diesel oil or large and complex scrubber installations for Emission Control Areas (ECA) operation as of 2015. First engine deliveries are foreseen for October 2014. Driven by upcoming fuel sulfur and NOx regulations in ECA, the M 34 DF will provide full flexibility for vessels operating in regulated and/or lesser regulated areas without major changes to the engine room or exhaust gas system, supporting the ease and simplicity of engine installation and certification. Although designed for unlimited operation on LNG, marine diesel oil and heavy fuel oil, the M 46 DF will reach industry- leading efficiency in gas mode. With a bore of 340 millimeters and stroke of 460, the engine was designed to be the preferred choice for gas electrical and mechanical propulsion applications notably in the offshore and cargo segments. The engine design features new real-time combustion monitoring, Flexible Camshaft Technology functionality as well as a lower valve train and several innovative monitoring and component solutions to ensure maximum safety during operation. Caterpillar will offer its service and support for the new MaK dual fuel engine, including installation and application, system integration support, as well as customer and crew training. The M 34 DF will be pass customer acceptance tests and classification approvals in Rostock, Germany and will be sold through Caterpillar’s MaK dealer network.